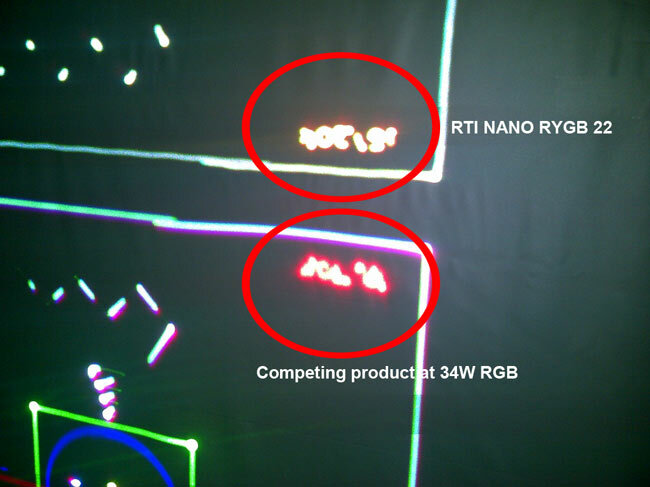 is a competing product with 34W RGB and CT-6215 scanners. 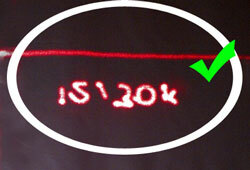 It uses diode array solutions for red and blue color and a green OPSL. 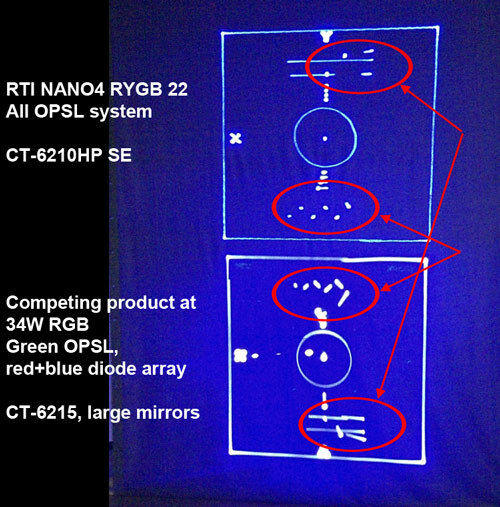 is a RTI NANO RGB system (up to 30W) with only OPSL sources and CT-6210HP SE scanners. 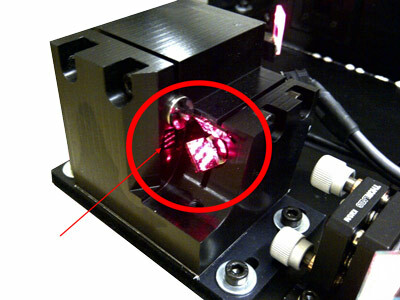 The red laser source of the competing product seems to be bigger and has a not-so-nice blur. You can already see some scanner issues of the competing product on this picture, but this is discussed further below. It's obvious that the array outlet window shows three layers of diodes that are combined by knife edge combination. If compared to the size of the screws around the outlet window it becomes clear that the general beam size is quite large. 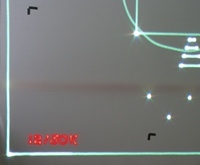 This is also due to the fact that there is a lot of space between the single diodes - it can even be seen very clearly. By the way: The combination in RTI diode modules works differently and thus achieves much closer rays of the single diodes. 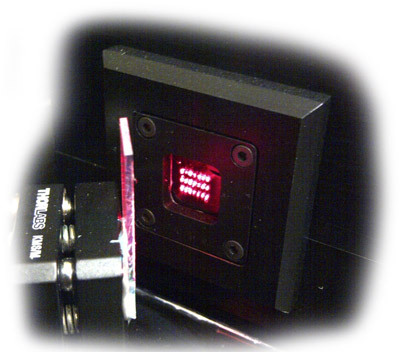 See details on diode array modules here - and why RTI diode array modules look much more precise than this one . Extremely precise and very narrow aligned, they fit on the very small mirrors. 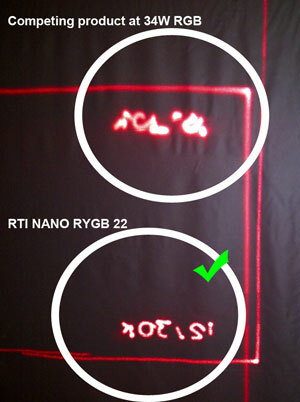 Projection size is rather small for 12m distance, but the text/numbers can still be read in the NANO projection, whereas the competing product shows more of a general blur. What does it mean if the beam is as blurry as the one in the competing unit? The testing is done on a 12m projection distance. If the distance is increased - for such strong units it is normally 100m and more - it is obvious what happens to the beam: It widens up even more and thus looses power much quicker than if the beam was more accurate. This results in less power at the projection area. Does this also apply for the second diode module in the system, the blue one? 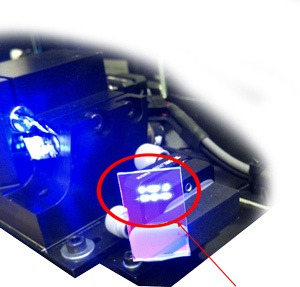 Picture 1 shows the dichroic filter that deflects the blue diode source to the scanner block of the competing laser system. By the way: Can you imagine how large the scanner mirrors need to be to handle such fat beams? 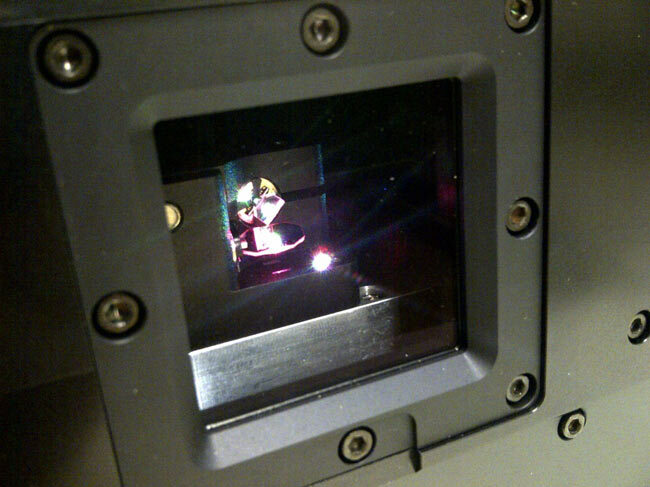 The beam is even bigger than the scanner mirrors so quite some power gets lost at the scanning optics. How does this affect the scanning quality? Another quite obvious thing is, that the scanning results of the compared unit with the CT-6215 is much worse than the results of the NANO unit - even though the general technology of the CT-6215 is superior to the CT-6210. The difference is the driver used: Whereas the competing product relies on own, basic standard drivers, RTI uses special advanced driver solutions that were explicitly designed for the CT-6210HP SE. 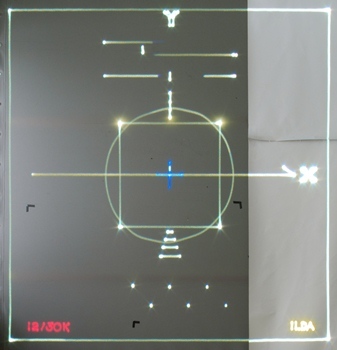 The larger the scanner mirrors that are used, the higher the inertia. This heavily affects the actual scanner accuracy and the scan speed, as higher inertia delays the actual scanner movement. 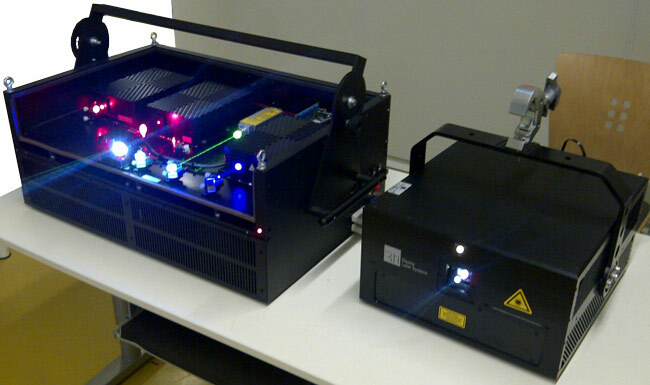 That's why RTI relies on small mirros - which they can use due to the great beam quality of the laser modules. 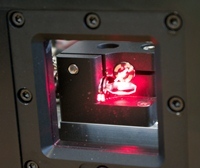 See details on diode array modules here- and why RTI diode array modules are so precise.